Two train operators in Russia have been fired and may soon face cruelty charges for their involvement in a sickening act that nearly claimed the life of a bear. 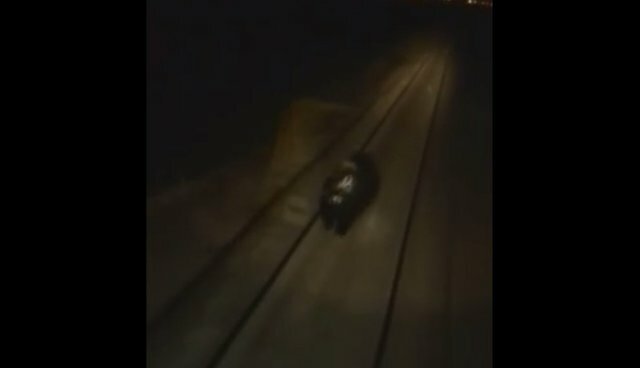 A video uploaded to YouTube in December captured the moment a train driver and his assistant laughed and cheered as they sped toward a bear on the tracks with the clear intention of running her over. The frightened animal can be seen trying to outpace the locomotive, only to be overtaken. Investigators later determined that the bear had narrowly escaped. Still, the disturbing footage quickly went viral across Russian media, including on news channel Rossiya 24, which condemned it a "monstrous incident." Law enforcement authorities also caught wind of the video and were able to determine approximately when and where it was shot, leading them to the two employees of a mining company in the Siberian city of Norilsk. According to state news RIA Novosti, the two fired train operators are being investigated by local police for animal cruelty.